A child goes missing in the United States every 40 seconds. Many are never heard from again. When a child does disappear, it's critical that parents get basic information to law enforcement authorities as soon as possible. That's why the FBI Friday announced a free iPhone application that will allow parents to keep this kind of info close at hand. The Child ID app gives parents a convenient place to electronically store data about their children. If an emergency occurs, the child's photo and vitals such as height, weight, etc. can be shown to security or police officers on the spot, or the information can be emailed to law enforcement authorities directly from the app. The app is currently available only for iPhone, but more platforms will be supported soon. The app also includes tops for keeping children safe. For example, "Tell your children to move away from cars that pull up beside them if they do not know the driver, even if the driver claims to know you," and "Teach your children not to play in isolated areas or not take shortcuts through empty parks, fields, or alleys." The app also includes instructions on what to do during the first 24 hours that a child is missing as well as the following 24 hours. 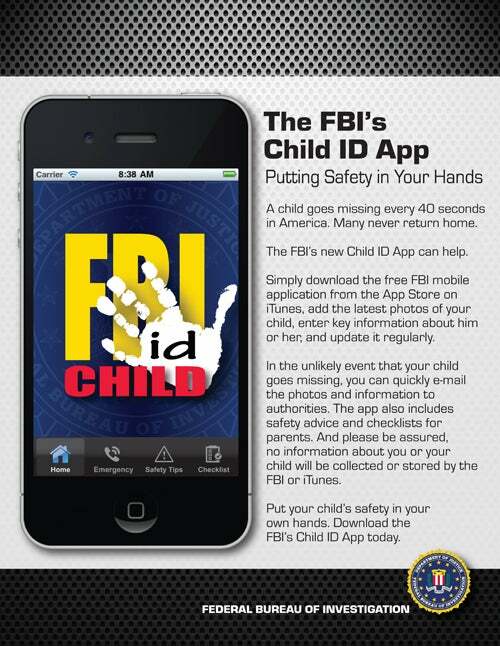 In the first 24 hours, for example, the app says the parent should limit access to their home, don't touch the child's room until the police have finished collecting evidence, ask law enforcement to put out a BOLO (Be On Look Out) for the child, and ask investigators to open a missing persons file for the child in the FBI's National Crime Information Center. During the second 24 hours, the app recommends volunteering to take a polygraph test, discussing the use of a reward with investigators, asking the police to install a phone in your home from which they can record phone calls, and discussing, with law enforcement, the creation of a website for gathering information and leads about the missing child. The app also includes a list of Web resources, such as Child Abduction: Resources for Victims and Families, Amber Alert, FBI Crimes Against Children Website, and the National Center for Missing & Exploited Children (NCMEC). The NCMEC and 911 are hot buttons in the app and can be dialed directly from within it. To give the app more visibility, the FBI is working to publicize the program with the American Football Coaches Association (AFCA), which will be producing a public service announcement about the app and will spread the word at various football games during the upcoming season. For those concerned about having an FBI app on their mobile phones, the agency notes that the software does not collect or store any photos or information entered into the app. All data resides solely on the mobile device until its owner needs to send it to authorities.